Until Bernadette, Lourdes was a small village off the beaten track. Now it is a sizeable town, largely dependent upon servicing the needs of its millions of pilgrims and visitors. It is one of the best known religious shrines in the world as well as being an excellent base for visiting the spectacular and beautiful Pyrenees Mountains. Bernadette was born at the Boly Mill on January 7th 1844, the eldest of nine children born to Louise and François Soubirous. The family was poor and Bernadette had poor health suffering from asthma. Whilst her parents worked she looked after the other children. In 1856 her father lost his job and the family were forced to move to the Cachot, a disused jail which had been abandoned because it was so unhealthy. These were years of famine in the region and in 1857 Bernadette went to live with her aunt in Bartres where she worked as a shepherdess and looked after a small child. In January 1858 she returned to Lourdes to prepare for her first Communion and to enrol in the free school of the Sisters of Charity. She was now 14 and, although considered a sensible girl, her lack of education and poor health caused difficulties. Bernadette told her sister of the vision and she in turn told their mother. Both children were beaten and forbidden to go back to the Grotto. On February 14th Bernadette got permission to visit the Grotto again and this time she sprinkled Holy Water at the Lady who smiled in return. As a result of this visit general interest in Lourdes began, most of it disapproving. Bernadette’s mother was upset at these ‘hallucinations’ and Bernadette suffered mocking and ridicule in the street. On February 25th under direction from the Lady, Bernadette began scratching and digging at the ground with her hands. The Lady had said, ‘Go and drink at the spring and wash in it.’ Bernadette unearthed a small spring and tried to drink it and wash with the muddy water—much to the surprise and consternation of the crowd who had gathered. The authorities then tried to interrogate Bernadette but they could not comprehend the matter. The parish priest Fr Peyramale kept a discreet distance. It was not until March 25th that the Lady finally revealed her name to Bernadette, ‘I am the Immaculate Conception.’ It was this that finally convinced Fr Peyramale that Bernadette was telling the truth. On April 7th there was the remarkable occasion when a candle burned for 10 minutes against Bernadette’s hand without her being harmed. The final apparition took place on April 16th with the Grotto by now barricaded by the local authorities and Bernadette kneeling some way off to see the Lady for the last time. Two years after the apparitions Bernadette went to live in the Hospice of the Sisters of Nevers and she joined the order in 1866, going to the novitiate in Nevers, from which time she never returned to Lourdes. In 1862 the Episcopal Commission had declared that the events had the hallmarks of truth and were worthy of belief. A statue had been placed in the Grotto in 1864 and the Crypt was blessed in 1866. Bernadette, after years of ill health, died in Nevers on April 16th 1879 and she was canonised in 1933. On February 26th 1858, the day after the spring began to flow at the Grotto, Louis Bouriette was cured of his blindness after washing his eyes in the water. His was the first miraculous cure and since then many cures have taken place. Although many thousands come to Lourdes on pilgrimage only a handful receive cures and many of these are not considered miraculous as the evidence is inconclusive. There are strict criteria laid down in the discernment of miracles and there was an interesting article in one of the recent editions of the Lourdes magazine about miracles in which Bishop Perrier wrote that it was becoming more difficult to define a miracle because of the advance of medicine and treatments given for various illnesses. He proposes that rather than just looking at the actual sickness in a person we look more to the person themselves and the restoration of their faith and spirit of service. The article appears in issue no 130 of the Lourdes Magazine. 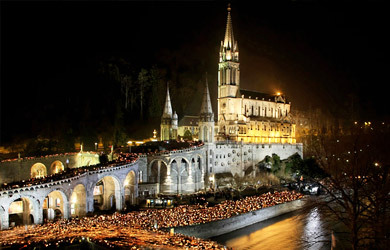 Over 60 cases have been declared miraculous and about thirty cases each year are carefully considered by the Medical Bureau and authorities in Lourdes. The most recently declared miracle was in 1999 when Mr J. P. Bely from Angouleme was declared cured from multiple sclerosis. Since the time of the apparitions people have come in ever increasing numbers in procession to Lourdes. To accommodate them, hotels have been built and the many souvenir shops and bars also serve a purpose. However we leave the hustle and bustle of the secular world behind us as we enter the Domaine. Within this space are the Grotto, the basilicas, chapels and Baths. Each year improvements are made. A lot of work has been taking place in recent years in the Rosary Basilica to restore the mosaics around the fifteen side chapels depicting the mysteries of the Rosary. Try and take some time to look at these during the week and pray the Rosary. The Great Organ of this basilica has also been restored and plans are being made to produce some representations of the Mysteries of Light. The wall above the Grotto that is the side of the Rosary Basilica and supports the Basilica of the Immaculate Conception has also been refurbished. This Basilica is also going to be refurbished. The old water taps situated next to the Grotto have been removed. Work also continues on the new Way of the Cross which will be accessible to the less able pilgrims. It is sited on the prairie opposite the Grotto The Stations are carved in stone by Maria de Faykod who carved the ‘Pieta’ that is situated in the St Bernadette Church. It will be this Way of the Cross that we will use with our sick pilgrims during our pilgrimage. The English speaking pilgrimages have donated the seventh station and this was blessed by Bishop Perrier. Solar panels have been installed on the roof of the Acceuil Notre Dame, the hospital that our diocese uses. The panels will produce around 70% of the hot water needed for showers and washbasins during the pilgrimage season. Lourdes is trying to do its bit for the environment! The Sanctuaries employ over 400 people as well as using the services of countless volunteers during the pilgrimage season. You are asked to be generous in the collections that take place during our Masses. The money goes to help with the upkeep and the work of the Sanctuaries. Monies given as offerings for candles also help in the upkeep of the Sanctuaries. As you enter the Domaine by St Joseph’s Gate over to your right you will see the bookshop. Here you can buy various books in English which explain the story of Lourdes and St Bernadette. You can buy recordings of some of the music of Lourdes and other music as well. You can also take out a subscription to the Lourdes magazine that is issued 8 times per year. The shop accepts the usual credit cards.